The Pope arrives in the city on Thursday evening, just hours before Pluto stations to go direct - a day when power brokers tremble or stride. He will address the United Nations in New York on Friday, the day that Mars squares Saturn. Sagittarius is also the sign associated with religion, and Saturn in the sign can indicate rigid dogma - something that Mars in Virgo might like to challenge with some facts from the other side of the fence. 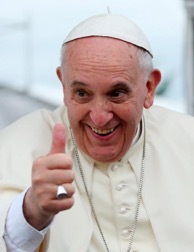 It will be interesting to see if Pope Francis can take the heat as well as he dishes it out. He has a good-guy reputation, but within the context of an institution that is dealing with both ideological and practical schisms, and there may be more than a bit of hypocrisy to point out. Whatever happens, watch the progress of the Pope's U.S. tour - it will say a lot about the themes of Saturn in Sagittarius for the next two years. Capricorn energy peaks this weekend, as the moon, Ceres, and Pluto all meet up in the sign. There's likely to be a strong pull towards environmental issues, particularly those centering on our food supply (Ceres is associated with the harvest and grains). But this is not a cheery, Earth Day kind of vibe. There is a darker side to the meeting of Ceres and Pluto. In the myth of Persephone (or Prosperina, to be keep to the Roman names), Ceres enters the underworld to save her daughter, who has been kidnapped by Pluto. Yet it isn't a superhero kind of rescue - Ceres bargains with Pluto, who eventually winds up with Prosperina with him in the underworld for half the year - hence our seasons, as the earth is cold and barren when Prosperina is below. We may thus expect compromises to be part of the picture, on both the collective level (with environmental issues) and personally. As we deal with some of the more difficult challenges facing us, we are unlikely to vanquish them with positive affirmations.What common ground can you find with your personal demons? What do they really need? Today's meeting takes place in Saturn's sign, stressing the material realm and its limitations rather than unlimited possibilities, so we probably need to strike a bargain with the cold hard facts. If it sounds like a less-than-romantic way to celebrate St. Valentine's Day, take heart (hey - just what kinda saint was this guy, anyway?). The sextile to Neptune should help to soften the harder edges of the Cap moon. Pay attention to your dreams this evening, as they may contain clues about getting larger visions down to earth, and a nice cruise can help shake off the journey to Pluto's realm.